Locations in green had recorded vacancies in 2017 but were occupied in 2018, those in blue were apparently occupied in 2017 but vacant in 2018 and those in purple were vacant both years. 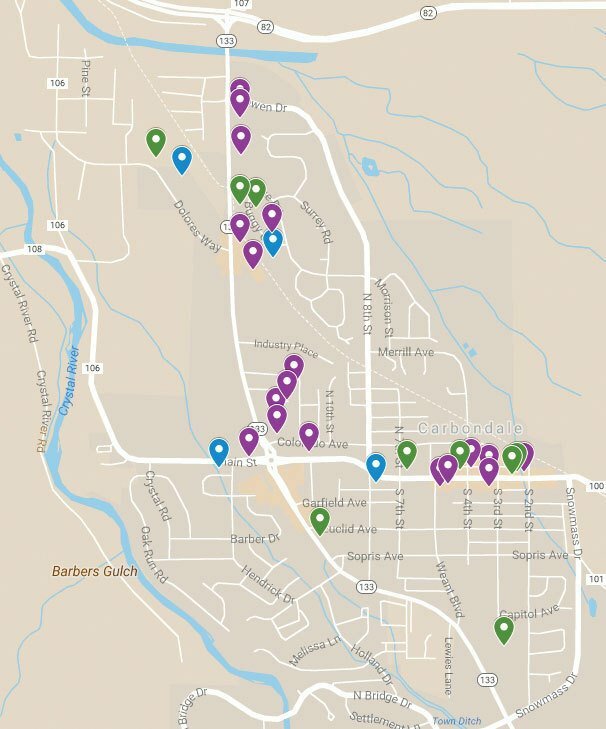 There are roughly 339 operating businesses within Carbondale (plus several in transition) and space for 33 more, according to The Sun’s second annual unofficial commercial inventory. That’s up from 306 and 39 respectively when our inaugural effort established a baseline this time last year. The municipality doesn’t issue business licenses and the Chamber of Commerce tracks only its members, so it can be difficult to ascertain whether local business is thriving or declining, much less calculate a commercial occupancy rate. As such, we were obliged to check each office building and industrial complex ourselves in order to offer a direct, quantifiable (though likely not comprehensive) assessment over time. We counted adjacent units together, didn’t distinguish between rental and tenant-owned spaces and left out government buildings altogether. As such, it’s likely that the apparent increase in overall inventory in a year when several units were actually removed is a result of shuffling and more efficient use of smaller spaces. Based on what we can tell from peering in windows, consulting directories and pestering other tenants, the town’s overall occupancy rate is solidly above 91 percent. That squares with an uptick in sales tax and what Town Manager Jay Harrington has seen on the ground. He cited new tenants for pretty much all the vacant restaurant spaces — see the adjacent story — plus pending developments like City Market, First Bank and the Stein Project as signs of the boom. Carbondale Chamber Director Andrea Stewart expressed similar enthusiasm. She particularly highlighted the 200 block of Main Street, which last year’s inventory found full of vacant space now occupied by an apothecary, a tattoo parlor and more. In general, she expressed a sense that the cultural and economic center of the community is expanding. A Main Street address remains the most common in our inventory — representing roughly one third of the total — but downtown also gets a boost from Fourth Street, Merrill and the Third Street Center (which is effectively vacancy free). The Highway 133 corridor, meanwhile, has as much vibrancy hidden down side streets as on the main drag. Thriving pockets of business include the manufacturing district off Dolores Way, the cannabis, car care and creativity hub that is Buggy Circle, and unassuming districts like Industry Place and ET Plaza. 1101 Village Rd. alone could rival a block of downtown — though upstairs offices are a surprising percentage of the inventory there, too. One of the perks of all that variety is the opportunity for myriad small operations — emboldened, perhaps, by the example set by the Creative District — to try out something new. Altai Chuluun is right in the middle of that entrepreneurial spirit with the GlenX coworking space, which is already looking to expand after less than a year in the Third Street Center. If the funding can be arranged, he’d like to see a space with small retail booths and private offices instead of just shared desks. He thinks Carbondale is a natural hub for that kind of innovation. Mayor Dan Richardson, meanwhile, denied possessing a crystal ball to see the future of economic development — particularly with respect to projects not yet built — but opted for optimsm. “I think the future looks very bright,” he said. Timbers Resorts made a big move one door down and now occupies the top half of 225 Main St.
Carbondale has its own shoe manufacturer, 5028 — info at weare5028.com. 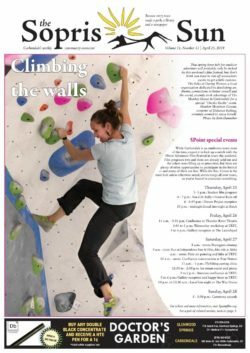 The Monkey House bouldering gym should open this summer, complete with ADA access. There has to be a story behind that old-looking cabin on top of a modern building at 1000 Dolores Way. At least one space upstairs in the Dinkel building is itching for a frosted glass window for a private investigator. The Red Rock Diner is not technically in town.